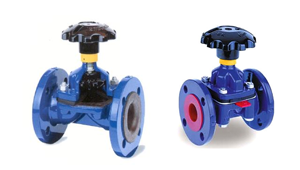 KHD Valves Automation Pvt Ltd is a High Quality Diaphragm Valves Manufacturer in Mumbai, Maharashtra, India. We are a leading manufacturer of Diaphragm Valves in Mumbai and nearby areas. Our Diaphragm Valves are manufactured according to International ASTM ANSI Standards, ASTM API Standards, ASTM DIN Standards in India. Mail us for Easy and Quick Quotes at Factory Prices. Diaphragm Valves consists of a Valves body with two or more ports, a diaphragm, and a "weir or saddle" or seat upon which the Diaphragm closes the valve.The basic construction of the Diaphragm Valves is quite simple. It is composed of three principal units called Body, Bonnet and Diaphragm. Diaphragm Valves are particularly designed for handling Corrosive, Abrasives, Viscous or Fibrous Fluids. Material Available: Cast Iron, Ductile Iron, Cast Steel, Stainless Steel & Duplex Stainless Steel. KHD Valves Automation Pvt Ltd are suppliers, dealers, exporters and manufacturers of Diaphragm Valves in India. Our high-grade range of Diaphragm Valves are perfectly . These are designed and developed in accordance with the international quality standards. Diaphragm Valves that are precisely engineered using the prime quality raw material. 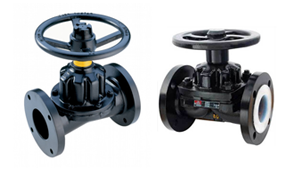 We offer customized Diaphragm Valves as per the requirements of the clients. Maintenance of Diaphragm Valves is very simple. By dismantling the Bonnet from the Body, the whole Trim Assembly can be taken out for cleaning and maintenance while the Body will remain in the Pipeline. Hence the design allows maintenance to save time and energy. Its linear flow characteristics, makes it perfect for throttling or modulating operations. On/off and control automation is supplied with Pneumatic Actuators or Cylinders. The most economical corrosion free and resisting Valves available today. Adaptable Body and Diaphragm materials. No contamination. The most suitable for Nuclear & Food Service. Easy dismantle and assembly possible without removing the body from pipeline. KHD Valves Automation Pvt Ltd is the best in business and world Leading dealers of Diaphragm Valves.